April | 2014 | JUDDER! Good day my lords and ladies of Juddershire! We have returned from the wilderness of Judders past, and can report that our previous Children’s Television Judder was a thing of confusing beauty! There were some spectucular, inspired and just plain wrong costumes, guest DJ Mark13 blew the roof off with a couple of banging guest DJ sets and the dancefloors were full of smiling faces. It truly felt like spring had sprung with a real festival vibe in the courtyard too! There are a few photos in the gallery with more to come soon.. 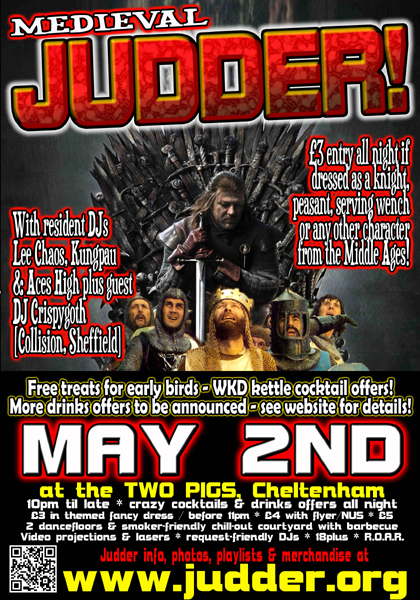 So, it’s time to look forward to our next Judder which is not so far away… on Friday May 2nd we bring you MEDIEVAL JUDDER! We’ve got some real treats lined up for this one, and we’ll be joined by guest DJ Crispygoth of Batfink & Collision infamy from Sheffield. It’s just £3 entry all night if you’re dressed as a knight, jester, king, queen, buxom wench or swarth sell-sword, so polish up your armour, don your hose and join us for a night of medieval debauchery, wassailing and ales aplenty! See you soon, my loyal servants of the court of Judder!